Detroit has never given up its secrets easily. In a region this sprawling, you've always needed a little inside information to know where to go. Unlike other cities that put all their show-stopping wonders on main drags, you'll need a few addresses and some car fare to survey our superlatives. And that's not a bad thing. For instance, take Detroit's Slow Roll ride: For years, it's grown by leaps and bounds, showing its participants some of the city's off-the-beaten-path marvels. The ride has become so successful it can draw thousands on warm Monday nights, drawing cyclists of all skill levels. The ride's organizers have become de facto ambassadors, helping bridge the city's divides between urban and suburban, black and white, speed bikers and freewheelers. 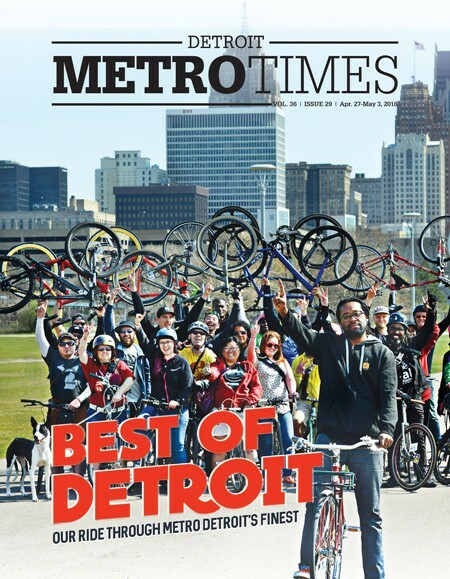 In the best sense, it's sort of like Metro Times' Best of Detroit. Just look at all the weird and far-flung places in this week's issue: We appealed to the "hive mind" of metro Detroit and got some answers that surprised even us. So pedal along with us for a ride past a couple hundred places you collectively called best and see it all laid out, secret by secret. The Best of Detroit 2016 is written by Michael Jackman, Allie Gross, Alysa Offman, Mike McGonigal, Alex Fluegel, Serena Maria Daniels, Colleen Kowalewski, Jack Roskopp, Luanne Lim, and Dustin Blitchok. The design is by Kristin Borden and the photography is by Vaughn Gurganian. Best Barbecue Restaurant in Washtenaw County – Old Carolina Barbecue Co.
Best Michigan Beer – Founders Brewing Co.
Best Handcrafted Cocktails – Oakland Art Novelty Co.
Best Local Etsy Shop – The Detroit Card Co.